You are here: Home > Blog > Community use > Why did we go down to the woods today? 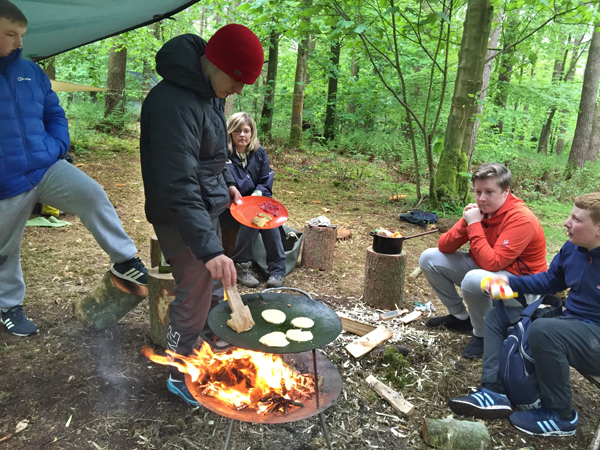 Recently we were given the opportunity to support a group of young men out into the woods over a period of ten weeks. They were a group that had been handpicked because they were finding the traditional school environment challenging. We were given permission to use a mixed woodland site and allowed to carry out small amounts of maintenance, which the group really enjoyed especially when felling a tree, checking the squirrel traps and using pruning saws and loppers. But “Why head out into the same woods for ten weeks?” surely we could have taught the use of this equipment in one day. In short, these skills were only part of what we wanted to accomplish with this project. This would be an opportunity to be in regular contact with nature in a woodland setting, which over time and with good support could help contribute to the development of their Emotional Intelligence and Emotional Literacy. This is the “transformative process” that Forest School Practitioners all over the UK are trained to facilitate. It may seem like a “fantastical” claim however there are a number of factors that can make a therapeutic woodland setting and our approach to participant’s personal development very effective when part of a long term and supported project. 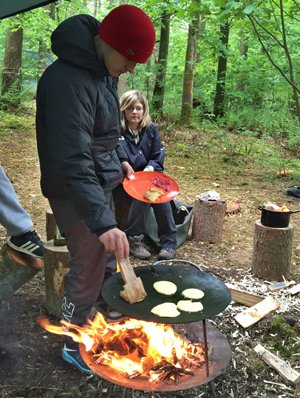 As a Forest School Practitioner during any project we frequently ask for feedback from individuals and the group as a whole, one of the most common positive experiences of this group was their ability to have space to deal with their own emotional states. Walking back to the van and chatting we were often told that “I normally would have punched something in class but here I can just go off on my own until I calm down,” They began to experience a better way of managing stress, one that doesn’t lead to them being excluded in some way from their education. So a woodland setting offers a therapeutic space away from four walls that can sometimes feel imposing and restrictive, even with the most supportive teachers. In fact just being outdoors surrounded by nature has many beneficial effects, Serotonin, the mood regulating hormone increases when in sunlight and natural sounds are shown to reduce stress. Plants produce a chemical called Phytoncide which is known to reduce the levels of Cortisol (the stress hormones) and also increases our immune function and G.A.B.A (the calming brain chemical). We literally feel better being outdoors. The physical exercise and the laughter that happens throughout a session plays an important part in our brain physiology, they both produce endorphins; the feel good hormones. There was definitely a lot of laughter, after spending ages learning new knots to put up hammocks only to have them fall down when more than one person sat in them! So why do we need to facilitate this? Why can they not just sit in the woods? 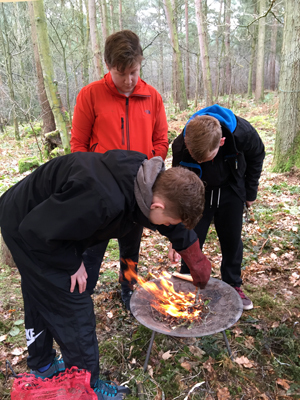 For some of the group they chose to do just that and sit quietly in the woods, but we also wanted to help them challenge themselves, manage themselves and be able to reflect on what was taking place during the sessions! When we did have splinter groups wanting to go off exploring. This tested our comfort zones, we had to respect the needs of these individuals and as young adults that needed space away from supervision. However, we also spent time with them, just chatting to them about their lives and experiences. Things which helped them to be more reflective and developed a better relationship. One way we hoped to facilitate the development of Emotional Literacy and Emotional Intelligence of these young adults was to provide chances to challenge themselves and then reflect on how they react to those situations. Our main theme during the 10 weeks was ‘Challenge’ and getting out of your comfort zone. For some just being outdoors getting muddy and dirty was a challenge and they later reflected on how they managed that “I coped and just got on with it”. It is the awareness and ability notice what strategies they can use to overcome for difficult situations that we try to foster and support. Those informal chats and activity based reflections during and after the sessions enabled us to help the group understand how they had managed themselves when facing difficulties and the impact of that behaviour. We had a young person who arrived after having a tough morning at home. He spent a while splitting up wood for the fire and then spent a lot of time just quietly whittling with a knife, working on his own away from the rest of the group, when I asked how this choice of activity had benefitted him he told me “I chose to whittle and it helped keep me calm and concentrate” he had chosen an activity that was self soothing and could express that and identify it too. Getting out of your comfort zone also allows the individual the opportunity to be a different person during the experience. 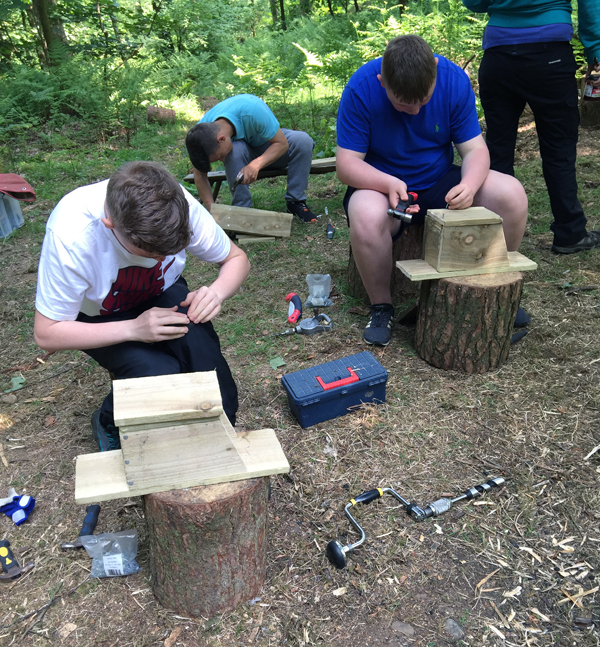 As part of Forest Schools, we learn new skills and take supported risks and using tools is a great way to do this, the group used knives, pruning saws, bow saws, loppers, bill hooks and secateurs. 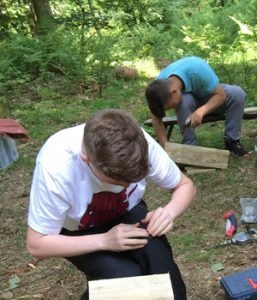 At one session, we introduce whittling with knives as a skill and a chance to use a dangerous tool safely; this shows trust in the individual’s abilities and normally has a very positive response. Whilst one young person was calmly and responsibly concentrating on this new task the teacher commented “wow, no one will believe that we gave him a knife to work with”. This young person’s behaviour was considered unpredictable at school but here he showed himself as very capable of taking safety advice and engaging fully in the task. Self awareness and self regulation was a challenge for every member of the group, however all adults have times when we struggle to recognise how we actually feel and how to change our behaviour to better meet our needs. Throughout this project we found talking in a big group challenging because the members of the group felt vulnerable already being placed outside of their comfort zone and so we opted for more one-to-one work. It was this one-to-one work that allowed us opportunities to notice moments of empathy and nurture that ability. Using our own empathy skills to actively hear and engage with the person speaking is so important because it role models the behaviour that we expect of them! This is a vital point of the Forest School Ethos which is to create a “community of learners”. Throughout all long term projects of this nature and when engaging in reflective practice Practitioners are constantly learning about themselves. We spent many hours debriefing about our own feelings and reactions to behaviour of the group and recognising which of our “buttons” were getting pressed during the sessions and then what “fall out” occurred. This is one of the reasons why we find this work so rewarding, that and the beautiful natural spaces that we often find ourselves in. So to conclude, we all went down to the woods to enjoy our natural surroundings, to challenge ourselves and to find a better understanding of how our emotional wellbeing affects us and our relationships with others. I was son No 5 on a farm, so no chance of inheritance and had ot’urbanise’ which I hated. BUT I managed to get 1 1/2 acres on route home from work and di ’20 minutes a day’ farmimg, and after multi species planting also Forestry. That kept me sane in a world of suburbia and green files, and probably married. Kept my Field for over 30 years. So Good on Yer! If it helps. 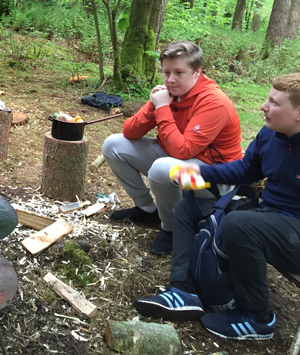 Guide camps gave me great experiences of ‘wooding’, collecting wood for wood fires, using an axe safely, building fires for cooking, and for camps fires, and some valuable one to one time with adults. a worthy project: we forget that city life can be so restrictive – “no space to play”! A School in the Forest? Forest Schools in the U.K.
What a Difference a Wood Makes! A Guide to Social and Therapeutic Horticulture.